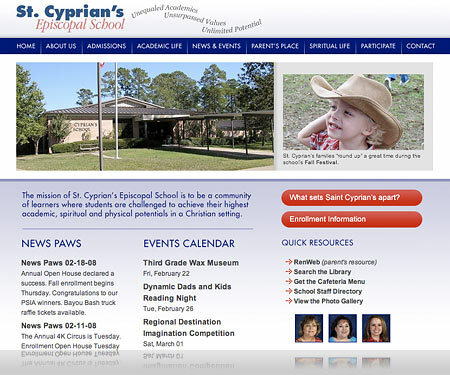 Saint Cyprian’s Episcopal School is a private school in Lufkin, Texas that approached SwansonStudios to update their website. Top priorities were a place to share their school newsletter, keep an online calendar of upcoming events, and create a resource where parents could interact more closely with the school. We were happy to fulfill these needs and more through creating their extensive new website around a content management system they now use to update the website themselves. When our Board of Trustees voted to allocate funds to update our school website we researched and obtained bids from several web designers. After much deliberation, the Board chose Peter Swanson of SwansonStudios. We found Peter to be very creative and easy to work with throughout the entire process. He was able to transform our ideas into an attractive and informative site in a short period of time. In addition, he provided us with an easy to understand website manual that allows us to update many of the pages ourselves. We would highly recommend Peter to anyone in need of website services.